Physical Rehabilitation: Sun Valley Animal Center is proud to present our Physical Rehabilitation Department. Our animal rehabilitation service offers a comprehensive veterinary rehabilitation assessments, Gait4dogs GAITRite analyses, underwater treadmill, swimming, manual therapy, therapeutic exercises, home exercise programs, electric stimulation, electroacupuncture, acupuncture, and laser treatments. Our two qualified veterinarians certified as Canine Veterinary Rehabilitation Therapists are ready to help provide you and your pet with Physical Rehabilitation Assessments and Treatment Plans. Our animal physical therapists will perform manual therapy, petrissage, stretching, joint mobilizations, joint glides, and other neurologic-based manual therapies, as well as design therapeutic exercise programs to help promote optimal movement and healing in your canine athlete or pet. In addition, we have veterinary technicians certified as Veterinary Rehabilitation Assistants to help you and your pet learn the therapeutic exercises prescribed by our veterinary Certified Canine Rehabilitation Therapists. Our Veterinary Rehabilitation Assistants will also help with your pet’s laser treatments, underwater treadmill exercises, and electric stimulation procedures. Comprehensive Veterinary Rehabilitation Assessment: Our Certified Canine Veterinary Rehabilitation Therapist will perform Gait Analysis, Joint Range of Motion, check for muscle tightness or shortening, as well as perform tests for common ligament sprains and muscle strains. Gait analysis will be done subjectively as well as with the GAITRite system if needed. Underwater Treadmill: Our Hydrotherapy tank can be utilized as an Underwater Treadmill or for swimming against a jet current. 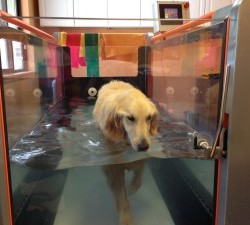 Hydrotherapy is an important component in many animal physical therapy cases. The hydrostatic pressure of water can increase sensory nerve impulses for neurologic re-patterning, and provide resistance for weight training and muscle gain in our patients. 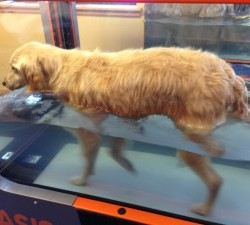 The underwater treadmill allows the body and brain to re-educate its nervous system pathways by helping the animal place their limbs in the correct position. The water provides buoyancy in geriatric, arthritic, and post-operative patients to help alleviate excess weight bearing pressure in sensitive joints while promoting full range of motion throughout movement. GAIT4Dog, GAITRite System: We offer the GAITRite computer-sensor walkway gait analysis. This system utilizes weight-bearing sensors to create a computer-generated graph of canine stride length and pressure to ground force. With this advanced technology, we can fine tune our physical assessments and provide objective data on lameness and improvements made during the healing process. Manual Therapy: During a Physical Rehabilitation appointment, our certified Canine Veterinary Rehabilitation Therapists will perform petrissage, joint mobilizations and joint glides, stretching where appropriate, joint compressions and distractions, as well as neurological stimulatory techniques such as PNF(Proprioceptive Neuromuscular Facilitation) to aid in reorganisation and adaptation of neural tissue, postoperative recovery, relaxation of muscles or strengthening as needed to return our patients to optimal function. Therapeutic Exercises: We have a large number of exercises to choose from in our clinic gymnasium. We utilize in house equipment or can modify therapeutic exercises for Home Excercise Programs. In clinic therapeutic exercises are often done with the underwater treadmill, physioballs, cavalettis, bosu balls, rocker board, wobble boards, stairs and other interactive equipement. 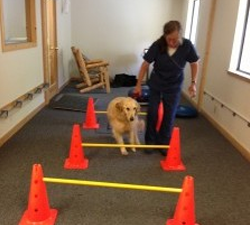 Therapeutic exercises are used both in neurologically affected animals as well as orthopedic cases. In our Neurologic cases we focus on neurologic repatterning and neuro-development. Therapeutic exercises may include spinal activation or proprioceptive neuromuscular facilitation, reflexive motor control techniques may employ temporal or spatial summation, or reciprocal innervation/inhibition. Orthopedic cases are more often focused on regaining range of motion and muscle strength. LASER: We utilize a Class IV laser in many of our treatment plans to help stimulate tissue healing and relieve pain. The Laser provides light therapy in a spectrum known to promote healing and pain relief. East Meets West Wellness Center: Counseling available for Balanced Home Prepared Diets. Traditional Chinese Veterinary Acupuncture and Traditional Chinese Veterinary Herbal Therapy utilizing the eight principals and five element diagnosis.